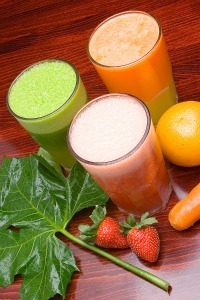 Juice fasting is an excellent choice for those who are new to the experience of fasting. Not only will you lose weight, but you can help reverse the aging process and facilitate healing. In fact, fasting has been around for centuries and is still an important element of religious life, though each religion may vary in practice and understanding. But today, millions of people cleanse their bodies to lose weight and maintain good health. It is a good way to give your digestive system a rest which allows the body to detoxify and gives the body’s organs a chance to take a break. This little vacation can help you feel and look younger while increasing energy levels. Another reason juice fasting has become so popular is that it supplies the body with much needed vitamins, minerals, nutrients, enzymes and antioxidants in addition to weight loss. The fast in total is 4 days. Two days to prepare, one day of fasting and one day to come off the fast. Whenever you see or read about a One Day Fast, there must always be a few days of preparation so you don’t release too many toxins at once. Many people try a 1 day (24 hour) fast and enjoy the results so much they commit themselves to a 2 day, even 3 day fast the next time. To prepare for your fast we recommend eating the following for two days before starting. You may also drink as much distilled water, throughout the day, as you like. Choose from a variety of juicing recipes to keep things exciting. Since the size of the stomach and the amount of digestive juices may decrease during a fast, the first meals after should be small and frequent. Avoid consuming milk, meat or heavy foods. Note: Children or pregnant and lactating women should never fast. It took years to wear your body down and it will take time to build it back up, but believe that it can be done.